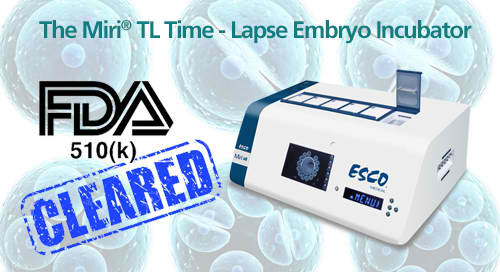 Esco Medical, the IVF business unit of the Esco Group, today announced that it has received the U.S Food and Drug Administration (FDA) 510(k) clearance on the Miri® Time-Lapse Embryo Incubator. The Miri® TL is a multi-room incubator with a built-in camera that continuously captures images of embryo developments until the day of transfer without any disturbance. This enables a detailed scoring of embryos cultured, for better prediction of developmental and implantation potential. The Miri® TL has a buil-in gas mixer and six (6) individual chambers with independent temperature-regulation to ensure optimal embryo culture conditions. It can simultaneously incubate up to 84 embryos in a safe and protected environment. The device includes the Miri® TL Viewer Software that assists IVF professionals in processing the data generated. “We are of course very pleased and proud to add Miri® TL to the list of 510(k) cleared products. Miri® TL provides an extensive list of Quality Control features from an extremely reliable gas mixer, through the HEPA/VOC filter, UV light for airflow sterilization and the built in pH Meter. Time-Lapse is an interesting and very promising technology, and we are looking forward to serving our current and future customers, enabling IVF clinics to benefit from observing the dynamics of embryo development,” says XiangQian (XQ) Lin, Group President and CEO. Esco Medical is a leading manufacturer and innovator of high-quality equipment such as long-term embryo incubators, ART workstations, Anti-Vibration Table, Time-Lapse incubators and is continuously developing advanced technologies to meet the increasing demand of the IVF industry. Most products are designed in Denmark and manufactured in the EU. Esco Medical is a business unit of the Esco Group, being a global life sciences tools provider in containment, clean air, pharmaceutical, and laboratory equipment technologies with active sales in over 100 countries and direct company offices in the top ten geographical markets.